Hlendrisa Seleth is a Dunmer enchantress who will take up residence at Tel Uvirith after you've built your Stronghold. 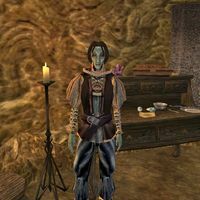 If you are of House Telvanni, she has a selection of magical scrolls for sale, and also offers enchanting services. If you belong to House Hlaalu or House Redoran, however, she will most likely attack you instead. This page was last modified on 13 May 2013, at 17:50.